I don’t think of myself as great at reflecting or describing emotional reactions to situations, but I’m going to try because TMC ’13 is totally worth me stretching outside my comfort zone. See these people here? There are four of the best friends I made at #TMC12 last summer. Last year, I was honored to share a car with Bowman (@bowmanimal), Elizabeth (@cheesemonkeysf), Julie (@jreulbach), and Sam (@samjshah), all folks I now consider dear friends. Folks I feel totally comfortable asking a favor of or brainstorming with. I’ve said to several folks this last week that Twitter Math Camp is all about the relationships I form. Sessions are great, guest speakers are awesome, and the locations have been totally wonderful. The highest points, though, have all been about the people I met. This year, I think I made three new best friends at TMC (shhh, they don’t know about each other). Anne (@sophgermain) and I bonded over differences between public & private schooling and issues of privilege. We’ve committed to reading & discussing Privileged: The Making of an Adolescent Elite at St. Paul’s School by SR Khan. Tina (@crstn85) and I bonded over feminism in the classroom, expanding the mathtwitterblogosphere (#MTBoS) humanely, as well as living room decor. I know that we’ll be collaborating on something really powerful this year because that’s just how she rolls and I want to get in on that action. @approx_normal and I were already bonded like sisters but after her statistics boot camp, I have renewed my bond with her. That woman is a force of nature and an amazing teacher. We should all get to experience statistics through one of her lessons if only to appreciate the beauty of this course. MRW a tweep is more awesome in person than online. I also want to shout out to Summer (@mathdiva77), Nik (@nik_d_maths), Sadie (@wahedahbug), Anna (@borschtwithanna), Adrienne (@shlagteach), Ashli (@mythagon), Chris (@absvalteaching), and Fawn (@fawnpnguyen) for being cooler in person than you are online, if that’s even possible. Anecdote because I think it’s cute: my wife kids me about y’all, calling you my internet friends or my little friends inside the computer. I was so happy she got to meet a few of you in person. Also, thanks to @approx_normal for holding back on giving a flying tackle of a hug upon introduction. Relationships matter. At what other conference have you found so many friendly folks? Folks who ask you to join them for lunch, who ask you to fold origami with them in the hotel lobby, and folks who roast you at a dueling piano bar. We bond tighter as a community when we spend time together off the clock. Where else do we hug it out, indeed. I hope that a few of you don’t mind me calling in on our friendships during the school year. Amy (@sqrt_1), Steph (@reilly1041), Leah (@elbee818) and the other math/physics teachers are definitely targets of mine for some Google Hangout planning sessions. I have this dream of writing labs with y’all. Speaking of the physics crossover, how cool was it that Frank (@fnoschese) and Fran (@Ms_Poodry) made it to Math Camp, even if just a little while? I just want to put out there that their influence on my craft as a physics teacher can’t be understated. One of my favorite conversations has been about how bring more people into the mathtwitterblogosphere community while maintaining the tight-knit family-like culture that makes it awesome. Tina (@crstn85), Sam (@samjshah), and Julie’s (@jreulbach) session on this topic is the start of lots of great relationship-building projects. I can’t wait to see them all happen, at least partly because these three have such an amazing track record of collaborative work. YOU can contribute to the mathtwitterblogosphere and I hope you will. TL;DR Megan loves all the people at #TMC13. Dan Goldner’s A Map of Problem-Based Class Designs. The big takeaway we were supposed to get here was that Dan’s figured out how to center a math class on Exeter-like problem solving. If you want to do similar, talk with Dan. That piece wasn’t so applicable in my classes, however. I know it wasn’t the main point of his presentation, but I really got into how we examined how six different classes are using a problem-based design. We first thought about decisions the teachers had to make to design their classes. Then we described how each case study made those decisions. I loved his case study approach and discussion that my class decisions express my values. Julie, Sam, and Tina’s Breaking Out of Ourselves. This was probably the single most important session at TMC13. Lots of great initiatives brainstormed will start showing up throughout the school year. This is a one of the most powerfully creative group of teachers I’ve ever been around. Elizabeth’s Math Teaching That Sticks. Not gonna lie, I attended this because I have followed Elizabeth around like a little duckling since last summer. She says meaningful things. She makes me think. I liked this session because we brainstormed rather than listened to a lecture. But then, I think just about everything at TMC worked that way. Elizabeth had us play a game to get to the brainstorming how to get ideas to stick with kids. Her version of Life on the Number Line for our session was an excellent way to get each group talking. Hedge’s Statistics Bootcamp (seems to have no link). I said it before, and I’ll say it again: she’s a force of nature in and out of the classroom. My takeaway here was that statistics is a course rich in interesting problems for kids to work through. Even kids who hate math. I just wish more math teachers were more comfortable with teaching the content. Best Organizer for Two Years Running: Lisa (@lmhenry9) put so much time and talent into this year’s conference. She has my eternal gratitude. She assembled an amazing conference staff and pulled off the most amazing conference we’ve ever attended. Coolest Item Thrown: @jensilvermath‘s blocks held together with magnets. Best Vendors Ever: Desmos and Mathalicious. These guys see us not as a revenue stream but as collaborators in bringing math to the world. I like that and hope they stay just as cool forever. 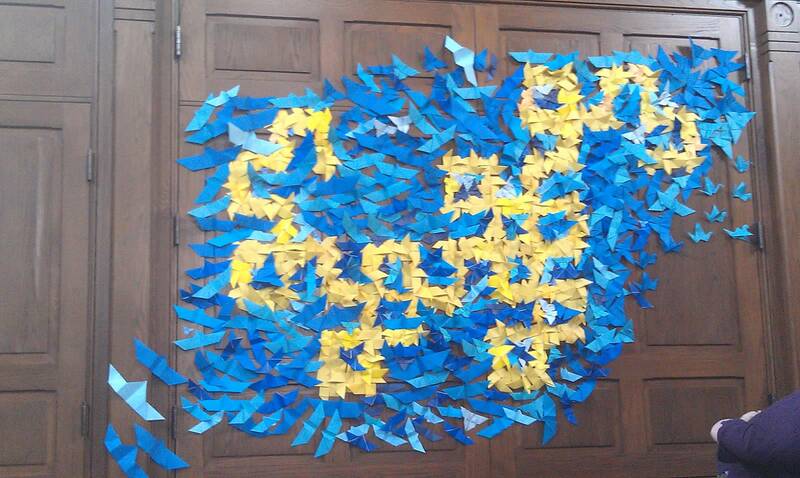 Best Group Effort: The Math Forum‘s logo in origami pinwheels and birds, thanks to @mythagon‘s vision.